Send this Fresh Baked Eggless Pineapple Cake as gift to your dear ones and pamper them with its delicious taste. This 1/2 Kg. Pineapple Cake is hand delivered to ensure freshness. Send this Fresh Baked Eggless Pineapple Cake as gift to your dear ones and pamper them with its delicious taste. This 1 Kg. Pineapple Cake is hand delivered to ensure freshness. 1 kg Eggless Strawberry Cake.Pamper the taste buds of the recipient with this freshly baked delicious, lip smacking strawberry flavored cake which is nicely garnished with dollops of whipped cream. 1 kg Eggless Vanilla Cake.A lip smacking and delicious freshly baked vanilla flavored cake which is beautifully garnished with tasty delicacies and toppings.The cake is hand delivered to ensure freshness. 1 kg Eggless Black Forest Cake.Surprise your dear ones with this freshly baked Black Forest cake filled with soft creams.The cake is hand delivered to ensure freshness. 12 Red Roses with 1 kg. Eggless Pineapple Cake.Pamper your taste buds with this freshly baked pineapple flavoured eggless cake garnished with mouthwatering delicacies.The cake is hand delivered to ensure freshness. 2 Kgs. Eggless Pineapple Cake. Pamper your taste buds with this freshly baked pineapple flavoured eggless cake garnished with mouthwatering delicacies.The cake is hand delivered to ensure freshness. 1 kg Eggless Plum Cake From Taj / 5 Star Bakery.Surprise your dear ones with this freshly baked Black Forest cake filled with soft creams.The cake is hand delivered to ensure freshness. 4 Kgs. 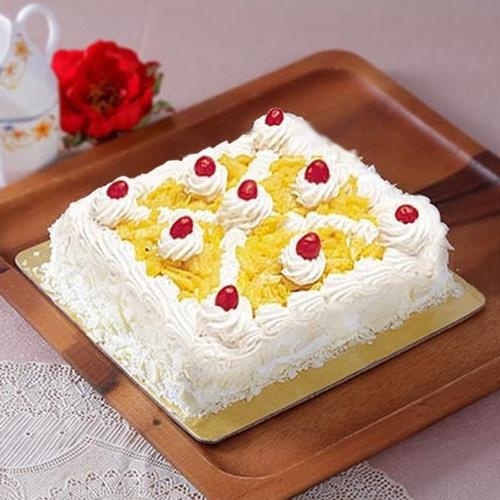 Eggless Pineapple Cake .Pamper your taste buds with this freshly baked pineapple flavoured eggless cake garnished with mouthwatering delicacies.The cake is hand delivered to ensure freshness.